Today we would like to introduce an oldie, but a goodie, the Sunchoke. 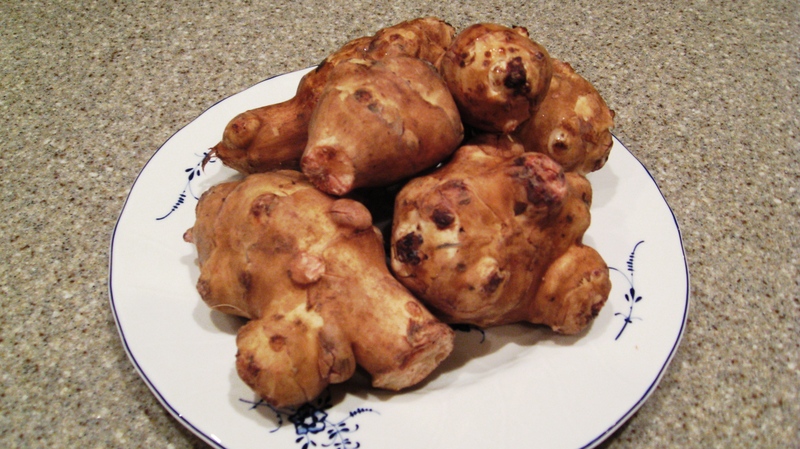 It is commonly known as “Jerusalem Artichoke“, but is actually a native of the United States. Surprisingly enough, it is a species of sunflower and is classified as a tuber. The taste varies in preparation. If peeled and eaten raw it most closely resembles that of water chestnuts – a little nutty, a little sweet and a light crunchy texture, but if boiled or roasted they take on a very similar taste to potatoes. However, “regular” potatoes varieties are all very high on the Glycemic Index (GI) scale, yet sunchokes have a medium GI score of only 50, the same as a sweet potato. Also, unlike those “regular” varieties, sunchokes do not contain solanine that pesky glycoalkaloid which is toxic and another reason to avoid them. If you’re going to cook them in thick slices for too long, you may run the risk of getting them too mushy. Thus we’ve sliced them rather thin and pan roasted them in our wok with excellent results. We served ours with Mark’s Aromatic Whole Grilled Chicken. A great combination. 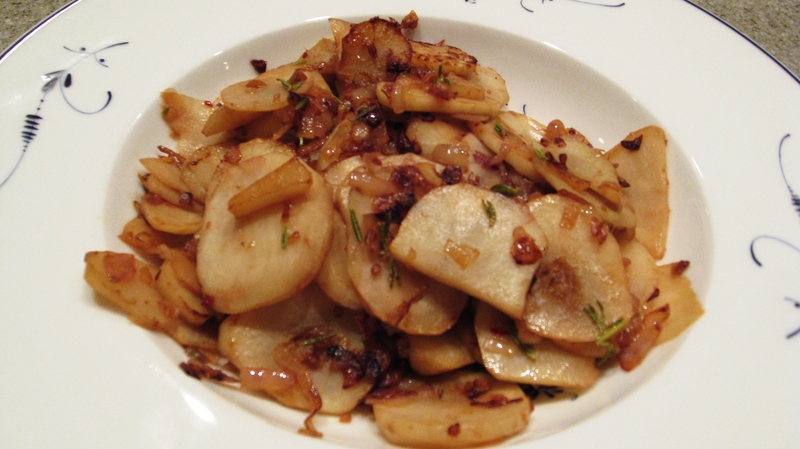 Pick sunchokes that are firm and don’t show any signs of mold or are wrinkly. Their shades can range from quite dark brown to very light brown, almost like ginger. If you purchase them before you intend to cook them, keep them refrigerated (unwashed) in a plastic bag for up to one week. So what’s in 1 cup of raw Sunchokes? Heat fat in wok, add garlic, shallots and rosemary. Roast until glossy and golden, then add sunchokes, salt and chili flakes. Roast for 15 – 20 minutes and serve. So easy so delicious! I don’t think I’ve ever had these before – I’ve gotta try it! Thank you for sharing.